I skipped experiment 24 of Make: Electronics. The reason is that I'm not really interested (at least not right now) in completing the Intrusion Alarm. I do appreciate what the author of the book, Charles Platt, is trying to achieve. He gives a couple of good hints for upgrades of the Alarm without presenting the complete schematics for the upgrades and leaves it to the reader to finish the job. However, I have yet got to find someone who did finish experiment 24. Anyway, I'll move to the last chapter of the book. In chapter 5 the topics branch out. Since I'm mostly interested in audio electronics I'll continue with experiment 25 to 30. 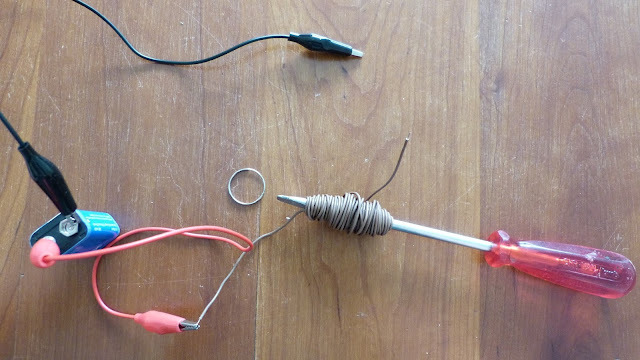 These experiments cover magnetism, speakers and audio filtering. Experiment 29 and 30 require the TEA2025B audio amplifier from STMicroelectronics. This IC is very hard to acquire locally. I finally ordered 50! of them in China (Aliexpress.com) for a very low price (14 cents a piece). Until I receive them I continue with the other experiments. 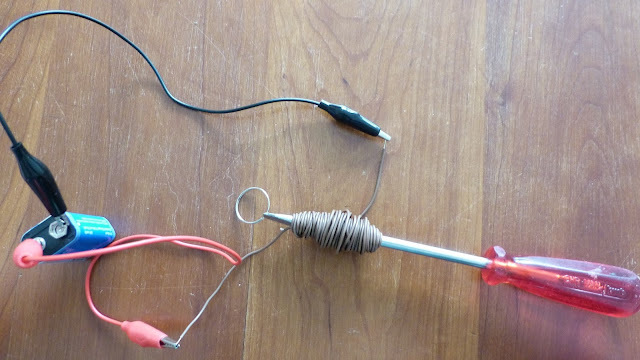 Experiment 25 demonstrates magnetism as an induced effect of electrical current through a wire. A long piece of wire is winded around the shaft of a screwdriver. The ends of the wire are connected to an AA battery (see image below). Due to the induced magnetism a paperclip or some other lightweight iron is attracted to the screwdriver. Very neat. This experiment in one form or the other can be found numerous times on the web. A nice example is Colin Cunninghams YouTube movie on the subject at https://www.youtube.com/watch?v=STDlCdZnIsw. Experiment 25: Wire winded around the shaft of a screwdriver. Tada, magnetism induced. I used eight feet of wire and a 9V block battery. I found the TEA2025B on eBay...US$3.50 for 5. More than the 14cents you paid but I didn't have to buy 50. Good luck. I hope to get to Experiment 29 this weekend. I know 50 is a lot. Hopefully I'll find some good use for them (I'm thinking about a small amplifier boxes for smartphones). I'm looking forward to your experiment 29.